Nina Karmon, described by the Frankfurter Allgemeine Zeitung as a well-grounded and deep artistic fighter with a beautiful sound, is an international soloist. Performances have brought her onto major concert stages like the Tonhalle in Zurich, the Konzerthaus in Vienna, the Gewandhaus in Leipzig, the Konzerthaus in Berlin, the Staatsoper in Munich, the Liederhalle in Stuttgart, the Harmonie in Heilbronn, the Atheneum in Bucharest, the Victoria Concert Hall in Singapore, the Yokohama Minato Mirai Hall in Japan, the Seoul Arts Center in Korea among others. Nina Karmon performed as a soloist with well known orchestras such as the Orchestra of the Bavarian State Opera in Munich, the Radio Symphony Orchestra in Stuttgart, the Norwegian Radio Orchestra of Oslo, the Stuttgart Philharmonic, the Bucarest Philharmonic, the Filarmonica Banatul Timisoara, the Symphony Orchestra Heilbronn, the Viennese Chamber Orchestra, the Stuttgart Chamber Orchestra, the Wuerttemberg Chamber Orchestra of Heilbronn, the Nuremberg Symphony Orchestra at the "Classic Open Air" concert in Nuremberg, which was attended by seventy-thousand people, the Korean Chamber Ensemble, the Manhattan Chamber Sinfonia, the Ostrobothnian Chamber Orchestra among others, under the baton of Zubin Mehta, Pinchas Zukerman, Helmuth Rilling, Bernhard Güller, Gabriel Feltz, Christian Simonis, Jörg Faerber, Igor Shukow, Ari Rasilainen, Juha Kangas, Emil Simon, Horia Andreescu, Gottfried Rabl, Peter Braschkat, Walter Hilgers among others. Greatly enriching and inspiring has also been her recent collaboration with famous pianist Gerhard Oppitz. As a devoted chamber musician, Ms. Karmon has worked with artists such as Peter Bruns, Alena Cherny, Corey Cerovsek, Amaury Coeytaux, Juan Jose Chuquisengo, Olivier Doise, Terhi Dostal, Niklas Eppinger, Ismo Eskelinen, Bengt Forsberg, David Frühwirth, Giovanni Gnocchi, Justus Grimm, Michèle Gurdal, Alexander Hülshoff, Thorsten Johanns, Hervé Joulain, Elisabeth Kufferath, Roland Krüger, Victor Julien-Laferrière, Trey Lee, Michel Lethiec, Jack Liebeck, Lilli Maijala, Vladimir Mendelssohn, Laura Mikkola, Lena Neudauer, Denis Omerovic, Natalia Prishepenko, Rachel Roberts, Martti Rousi, Pauline Sachse, Guido Schiefen, Hariolf Schlichtig, Henri Sigfridsson, Maria Sofianska, Nina Tichman, Oliver Triendl, Gunars Upatnieks, Wen Sinn Yang, Wen Xiao Zheng among others. She has also been heard at the Kuhmo Festival, the Iitti Festival and the Karjalohja Festival in Finland, the Muskoka Lakes Festival in Canada, the Mainly Mozart Festival in Coral Gables, Florida, the Ludwigsburger Schlossfestspiele, the Hohenloher Kultursommer, the Oberstdorfer Musiksommer, Classix Kempten, the Mozartiade and the Mosel Festwochen in Germany. In September 2018 a CD with works for violin and piano by Finnish composer Toivo Kuula has been released on the cpo label. Other recordings include piano quartets by Finnish composers Ilmari Hannikainen und Helvi Leiviskä, released by Telos Music Records. Sonatas for piano and violin by Ludwig van Beethoven, Johannes Brahms, Richard Strauss and Erwin Schulhoff; Franz Schubert’s fantasy in C and the Groteske for violin and piano by the German composer Rudi Stefan, whose career was abruptly ended at the age of twenty-eight in World War I, as well as the horn trio by the Hungarian composer György Ligeti. Astor Piazzolla's Histoire du Tango for violin and guitar is available on iTunes. In 2008, Nina Karmon started the Chamber Music Festival at Schaubeck Castle in Steinheim. Every year in spring, internationally known musicians come together in the castle’s charming barn to make music. When she was five years old, Nina Karmon, born in Stuttgart, started to learn cello with her mother, a Finnish cellist. Shortly before her seventh birthday she took up the violin and in the years following she was taught by her father, who at the time was concertmaster of the Stuttgart Radio Symphony Orchestra. 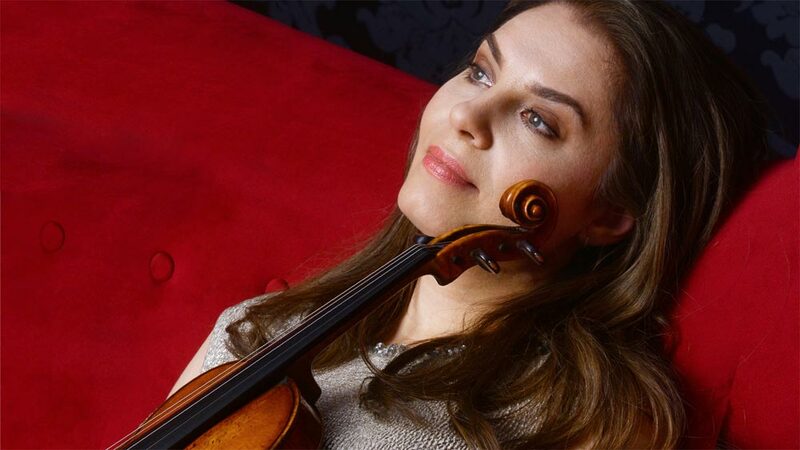 After further studies with Silvia Markovici, Vladimir Landsman, Radu Bozgan, and at the Hans- Eisler University in Berlin with Prof. Werner Scholz, she went to New York City for three years as a student of Pinchas Zukerman and Patinka Kopec at the Manhattan School of Music. After this time she returned to Europe.